Here are HG's picks for the latest & greatest breakout foods (and no, they won't cause pimples -- they're BREAKOUT foods because we love 'em!). Wow these things are good -- teeny pieces of cacao (the bean that chocolate is made from) coated in dark chocolate. Even if you're not a fan of dark chocolate, you'll likely fall head over heels in love with these crazy-cute snacks. They come in Flavor 50 (cacao nips dunked in 50% dark chocolate), Flavor 65 (cacao nips dunked in 65% dark chocolate) and Flavor 70 (cacao nips dunked in 70% dark chocolate w/espresso). These little dipped beans are intense, sweet and can satisfy a chocolate craving STAT. One of our favorite things about 'em is the super-cute tins they come in. And the fact that you can eat the whole tin for just 140 calories doesn't hurt either. But the truth is, these are so satisfying that you really won't need or want to finish all of 'em in one sitting, so they actually end up lasting a pretty long time. We think this is one of the best chocolate finds EVER. 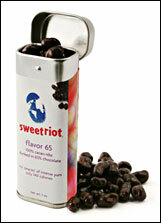 Find Sweetriot at specialty markets, natural foods stores and online at sweetriot.com. We're freaks for french fries, and we often look for baked, potato-y snacks to help satisfy our cravings for the things. 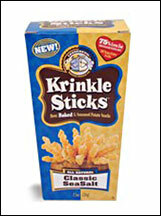 We really hit the jackpot when we discovered LesserEvil's Krinkle Sticks. Words alone cannot describe our love of these crunchy treats (we would need to squeal and do some sort of interpretive dance to fully convey our sentiments). Imagine taking the most PERFECT crinkle-cut diner french fry, adding just the right amount of salt to it, and then baking it until ALL of the greasiness went away and all that was left was a delicious, light, airy version of its former self. That's EXACTLY what these things are like. With 75% less fat than potato chips and no trans-fatty acids (plus 2g of fiber in every serving), these are also a snack you can feel pretty good about nibbling on. We actually like to dip 'em in ketchup, making them taste even MORE like fries. In fact, we have been BEGGING the LesserEvil guys to make a "Fries 'n Ketchup" flavor (they already have BBQ, cajun, and sour cream & onion ones). Wanna help us (there's strength in numbers, people!)? Click here and send them a note demanding that they create a ketchupy flavor ASAP! If you have a hard time locating these at stores, you can buy 'em online. There is absolutely NOTHING we don't LOVE about Everybody's Nuts! pistachios. Sure their nuts are, as promised, big and open (two HUGE plusses for pistachios...how irritating is it to get a CLOSED one?!). And they taste fantastic (as pistachios often do). But the entire look and feel of the Everybody's Nuts! brand and packaging is what really gets us. Their logo is ADORABLE and friendly. 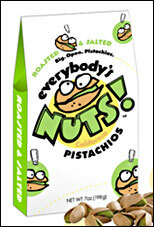 Their "mascot", a googly-eyed pistachio with a permanent smile, is insanely cute and lovable. All of the copy on the box (and in the surprise little insert found inside) is really fun and funny. Even the box is cool!!! Their unique promise is that you will never ever find a closed nut inside their boxes. If, on the off chance, you do, they'll send you a brand-new box of nuts for free! Kind of makes you want to scour their packages in search of closed nuts, doesn't it? Don't waste your time. You won't find any. Find these at select markets and specialty stores. For more info, click here. We don't want to get all boring on you, but we really, really, really enjoy eating egg whites. We like 'em hard-boiled, scrambled, and we like to make omelettes out of them, too. But it's not always easy for people to get their hands on egg whites. What we mean is, if you have the time to whip out your pan at home in the AM, you can ALWAYS find a way to scramble up something healthy. But when you order egg whites from a restaurant ('cuz you're in a rush or don't feel like dealing with cooking or cleaning up) there's a very good chance they'll be prepared with lots of butter or oil (no matter how many times or how politely you ask them not to do this). That's why we are now obsessing over these Eggology On-the-Go cups. All you need to do is pop one of these suckers in the microwave and in about 90 seconds you'll have a cute, puffy cup filled to the brim with yummy egg whites! We like to melt a little fat-free or low-fat cheese on 'em but they're great as is -- and they could NOT be easier to carry and store. 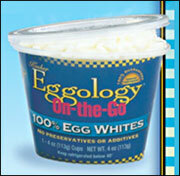 Find Eggology at select markets. May 19th is National Devil's Food Cake Day. Celebrate with some devilishly good Yum Yum Brownie Muffins! Yay! HG News You Can Use: BOCA meatless products ROCK! HG LOVES their awesome lasagna, chili, b-fast wraps, burgers and more. All BOCA products are lower in fat and saturated fat and most are lower in cholesterol and calories than their meat-based counterparts. Click here for the 411! Share these reviews with everyone you like -- click "send to a friend" NOW!